Forgot that thing you were supposed to do today? Missed the dentist appoint you forgot you had? Which child is supposed to go where tonight? Let’s face it, we all are juggling way too many balls in the air with our family. And it’s likely that you’re the one responsible for it all or at least for putting a plan to get everyone where they should be. For me, I need to write everything down or else it is forgotten. I don’t care if you told me last week, yesterday or even earlier that day, my brain processes tons of information and things slip by until it’s too late. I’m sure I’m not alone. This means I need a daily to-do list. You may be an app person, I like to use Asana for this for my blogs and business. But for my daily tasks, I like to write them down. The physical act of checking things off of my list is very satisfying. It does work for me so maybe give it a go for you. I made this printable editable so you if you have Adobe reader you can write in the list on the computer. Personally, I prefer to print it out and write in it with a pen. The physical act of writing drills it in and make sure I remember it and I just hate wasting time typing it all out. 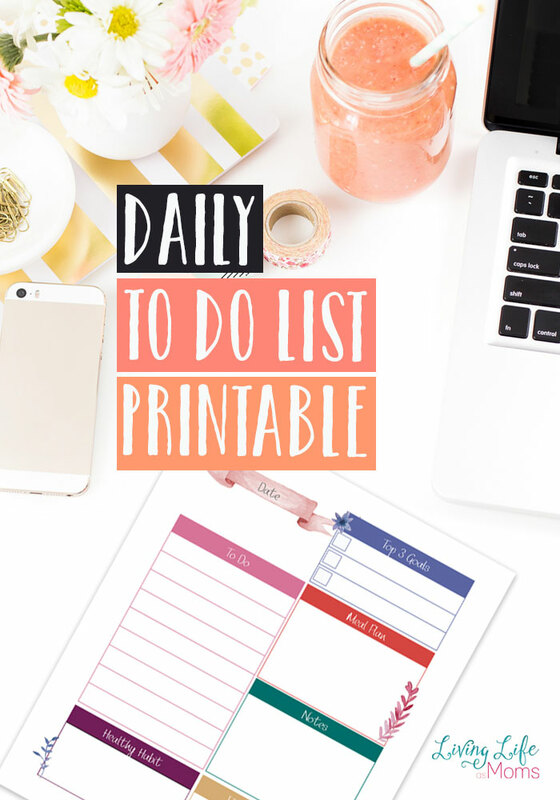 Want more Free Organization Printables for Busy Moms? Grab them to get a hold of your home and get more organized. Thanks for all the free printables and for hosting the giveaway! Always remember that you are the best mama for your kids!! Every day, you get to start fresh with homeschooling. If you feel like you need a break, or your kids need a break, take one! Grab some coffee, give your kids ample time to play outside, or go on a fun field trip. Sometimes, it’s Mom who needs to recharge, and there is no shame in that! Do what you need to do for yourself, and don’t feel bad about putting yourself first once in awhile. Our kids need to learn that we as their parents need to take care of ourselves. Nap when the kids nap. Best tip to offer other mothers–don’t expect your children to do the same things at the same time as a sibling. They all grow and mature at different rates. Enjoy each moment with your child. Be consistent, even when you’re tired. Live everyday like it is your lady. If you’re married, nurture your marriage. It’s one of the best gifts you can give to your kids! Right? I do that too, lol. Best tip – let the Holy Spirit be your guide!